Looking forward to seeing everyone at September General Meeting. Bring a friend or two. Doors open at 12:30, so please try to arrive on time to sign in and socialize. 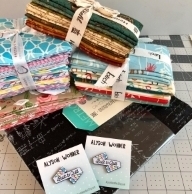 This month Abbie and AlysonC will be hosting a DeStash Table - cash only! Make one to swap and one for our BQE sale table. Everyone loves to munch on goodies at break - bring something to share if you wish. BQE Update - Quilt Entry opened September 1st - don't wait only 200 quilts guaranteed to be displayed. Show & Tell: Bring your modern quilts and projects to show off! Thimble if you use one. 2~5” round fabrics. The center 3” will show if you want to fuzzy cut, embroider or piece. Please have the 5” circle cut out before the meeting so you can start sewing right away. Oct 6th Hand Sashiko Workshop with Jennifer Lee - only a few spots left! ***NEW*** 50/50 raffle - bring cash and you could win HALF! Raffle basket next month. Bring any donations for the basket this month. Remember to check Quilt News and Events page for quilty fun and contests you may want to enter. Thanks Nicole for updating!